This study examines the inclusion of the music products industry as part of an overall music business curriculum in collegiate music industry programs. Historically, most music industry curricula have focused heavily on topics such as recording, live performance, music publishing, music licensing, music and media, and artist management. While some of these traditional music fields have seen wide-sweeping changes in their business models in recent years, the music products industry has continued to be a relatively steady and significantly relevant part of the overall industry, with many job opportunities for music industry graduates. However, coursework reflecting this portion of the industry is often underrepresented or even completely absent from many curricula. This study defines the music products industry and its component parts. It further examines the curriculum of many collegiate music business programs as correlated with the employee candidate skills and knowledge needs of retailers and manufacturers of the music products industry through two research studies. The music industry has many different components, and some are more familiar to the public than others. Students first interested in a career in the industry are often mesmerized by the attraction of rock stars, hip-hop artists, and the glamor of the entertainment industry as portrayed by the media. The music industry is, however, like any other business, having to produce sustainable income streams connected to both tangible and intangible assets. These assets consist of familiar and often glamorous products such as the entertainment career of an artist or the intellectual property of a song or recording. Classes focusing on music agency, artist management, recording, and licensing have long been a foundation of many collegiate music industry curricula. Less familiar or glamorous is the music products sector which is comprised of instruments, accessories, print music, recording technology equipment, sound and lighting, and other smaller categories. It is this sector which is often hidden or under-represented by collegiate curricula. Our findings indicate that this sector, with its relatively stable and abundant jobs should be better represented to music industry students to give a more accurate and realistic view of their future career choices. When examining the academic curriculum of many music industry programs in colleges and universities, however, there appears to be an absence of material dedicated to the music products sector. There also seems to be a lack of information and coverage related to music products in the music industry sector within peer-reviewed journals such as The Music & Entertainment Educators Association (MEIEA) Journal as well as most textbooks regarding the music industry at large. Whether this lack is due to academic time constraints, unfamiliarity with the market segment, or simple indifference by faculty and students, our research focused on this imbalance. Given the large and relatively healthy part of this music industry segment, shouldn’t music business schools be refocusing their curriculum to at least include this field of study as part of their overall curriculum? 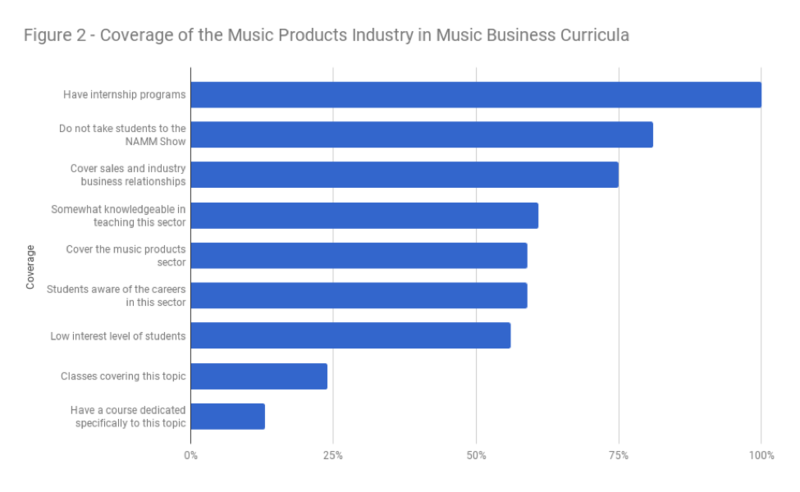 To address this issue, we needed to examine both the current curricula of music business schools and the needs of the music products industry, as defined by the music products industry retailers and manufacturers. With gross sales in the music products industry topping $16.3 billion dollars globally each year and $7.1 billion in the United States alone (43.40% global share), the music products sector of the industry represents about 34% of the overall $47.5 billion global music industry, and with it, many employment opportunities.4The 2017 NAMM Global Report Recovering from the effects of a global recession that affected nearly all manufacturing, distribution and retailing, the music products industry in the U.S. has nearly recovered to its once high point of $7.4 billion in 2007. Interest in the products segment has never been greater, as reflected by the record-breaking 106,928 visitors (+5%) and 1,779 exhibitors (+3%) at NAMM’s most important and highest profile event, the 2017 Winter Show in Anaheim, California.5“The 2017 NAMM Show Delivers" Music Inc. March/April 2017: 46-49. The primary European trade fair Musikmesse, which is held annually in Frankfurt, Germany each spring, saw a slight decline in attendance for 2017. The 2017 attendance figures were 105,896, which were not as high as their peak numbers in 2013 at 113,000.6“Musikmesse 2017 Numbers Down Slightly from Last Year, but Positive Reaction to Ongoing However, this is not symptomatic of disinterest, but rather a continuing globalization of the music products industry. For example, one major factor affecting attendance at Musikmesse Frankfurt is the Music China trade show in Shanghai. Now in its sixteenth year of operation, Music China’s 2016 show had 90,000 visitors from more than 86 countries and regions.7“Welcome to Music China.” http://music-china.hk.messefrankfurt.com/shanghai/en/visitors/welcome.html. Many of the trade customers from Asia are choosing to attend Music China instead of Musikmesse Frankfurt. The top hundred North America suppliers in the music products industry alone generated $9.897 billion in revenues in 2016 and employed 30,059 music professionals. Suppliers often represent large, stable corporations offering many employment opportunities with traditional retirement incentives, health benefits, and other employee incentives.8"A year of the status quo." Music Trades, April 2017, p. 104+. The 301 top music products retailers outside of the U.S. in 2016 came from 43 countries, employed more than 24,000 people, and operated 1,747 storefronts. Their revenue was $5.2 billion.9"Music Retail Around the Globe." Music Trades, May 2017, p. 68. Given these statistics, the size and scope of this part of the industry would seem to warrant significant representation in collegiate music industry programs. When examining the academic curricula of these programs in colleges and universities, however, there appears to be an absence of material dedicated to the music products sector. As part of this study, it was important to identify the needs of the music products industry and compare them to curricula provided by many of the university programs, identifying strengths and weaknesses of these programs, and making recommendations for changes. First, let’s further examine what is defined as the “music products industry” in the context of this paper. A June 2017 article in The Washington Post, “Why My Guitar Gently Weeps” echoes this change in the fretted market.11Edgers, Geoff. “Why My Guitar Gently Weeps.” Washington Post, June 22, 2017. One of the factors that NAMM attributes to this change is the increase of female consumers who tend to prefer acoustic guitars. This category also includes the sales of amps, effects, and guitar strings. There was an additional increase in revenue from musical instruments at a price point of over $1,000.12Ibid. The sales growth trend continued in 2016 with an increase of 2.2% to $1.8 billion. 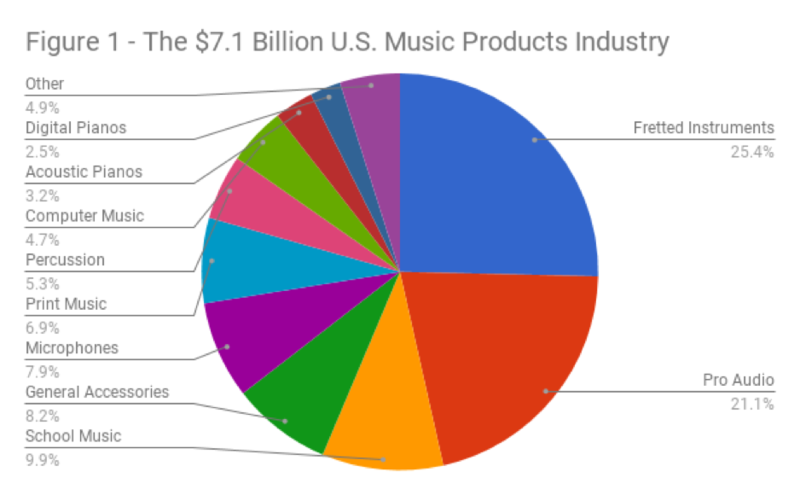 The top ten categories in the U.S. music products industry, which students should keep in mind as employment opportunities, consist of fretted products, pro audio, general accessories, wind instruments, microphones, print music, percussion, computer music products, acoustic pianos, and digital pianos. Fretted products and effects are the top revenue category and include acoustic and electric guitars, basses, ukuleles, amplifiers, as well as related guitar accessories such as strings and effects pedals. Revenue was $1.8 billion in the U.S., an increase of 2.2% over the prior year’s sales. This category represents 25% of industry sales, and it experienced the best performance in seven years.13"The music industry report card for 2016: which categories are up, which are down, and why, along with analysis of the trends driving industry revenues." Music Trades, Apr. 2017, p. 58+. Pro audio is the second largest category at $1.5 billion in sales in the U.S., and sales have been virtually flat, represented by a drop of a mere 0.14% from the prior year. In years past this category has been affected by economic conditions and advances in technology, and sales have increased in areas of houses of worship and educational areas. Revenue from performance venues was flat in 2016, due to falling product prices in this category.14Ibid. However, there is a longer-term value of pro audio to consider as a stable growth (and therefore possible employment) area, as a result of the realignment of recording spaces away from commercial studios toward more specialized projects, or home studios. General accessories is the third largest category and includes cases, stands, tuners, metronomes, straps, reeds, mouthpieces, care kits, harmonicas, replacement parts, and various other small goods. The sales of this category were up 3% at $579 million. There are many new items on the market, plus many small products retailing for under $100. Wind instruments is the fourth largest category with $577 million in revenue, or a 1.72% increase over the prior year. Unit sales in this category were up 1.18%. The category experienced higher sales of step-up instruments as well, which are higher quality instruments than student models, and geared for middle school, high school and some college students. The primary customer base for professional instruments consists of college students and professionals. National participation in school music levels remained unchanged. Sales in this category are directly related to K-12 student enrollment, which was up .09% in 2016. The area of microphones is the fifth largest category and was up 2.55% in 2016 at $563 million. Cabled microphones were up 0.74% and wireless microphones were up 7.64%.15The 2017 NAMM Global Report The year 2016 also marked an important year in the history of the microphone, commemorating 100 years since Edward Charles (E.C.) Wente, a Western Electric/Bell Labs employee invented the first condenser microphone in 1916.16Petersen, G. (2016, 10). 100 years of the condenser microphone. Front of House, 15, 53. Specific jobs in the manufacturing and retail distribution business include sales representatives, sales managers, district sales managers, marketing representatives, marketing managers, specific product category buyers, accounting staff, as well as warehouse staff and its management. Ideally, music industry students should be educated in all these potential employment avenues, with music products being a viable option. To understand the music products industry, students must grasp how music products are manufactured and distributed in the marketplace. Music products retailing is still strong throughout the world, but it faces great challenges in new and used product sales from websites such as Amazon, Craigslist, and eBay. There has also been a great deal of consolidation in this part of the industry as smaller retailers have been acquired by mid-sized and larger retailers across the country, such as Guitar Center purchasing the online company Musician’s Friend in 199924Ibid., Music & Arts in 200525"Guitar Center Acquires Musician’s Friend for $50 million." Music Trades, June 1999, p. 153., and Woodwind & Brasswind in 200626"Guitar Center Inc.: Music & Arts Acquisition Will Expand Beginner Segment." Wall Street Journal (New York, N.Y.), February 10, 2005..
An aspect of the industry to consider is that there are major music products distributors that serve as middlemen between the manufacturers and retailers. These companies serve a very important role in the industry, especially for smaller retailers. Instead of the retailer having to set up accounts and order directly from multiple manufacturers, most of whom which have discount policies based on volume with some minimum requirements in order to have the ability to order direct, these retailers can order products from many manufacturers through distribution companies. For example, KMC Music (a division of Jam Industries) in Bloomfield, CT distributes everything from guitars, percussion, amplifiers and effects, accessories, band, orchestra, education products, pro audio, and lighting. Many of these companies also import unique products from foreign manufacturers. Jobs in the music retail sector of the industry include sales representatives, marketing coordinators, events coordinators (for stores that conduct workshops for teachers and end-users on various products), accounting staff, inventory managers, product buyers, road reps (who visit teachers), and various store managers. These jobs put employees on the front lines, working directly with consumers and often represent ideal entry-level opportunities for the music products industry. Previous experience in the retail music products sector is also highly valued by product manufacturers and is often a key prerequisite when selecting employees for their companies. The ability to bring product knowledge, marketplace trends, and end-customer sales experience is critical to competing manufacturers. This coupled with basic business skills such as accounting, marketing, and finance make for competitive employees. Music retailers come in a few different forms and sizes, and highlight different features in products and services:27"Guitar Center Agrees to Buy The Woodwind & The Brasswind Assets." FinancialWire, 2006, 1. School Music Dealers specialize in band and orchestra instruments and equipment. Their instruments are acquired by either schools or families and they offer purchase, or rent-to-own instruments. There are three distinct levels of instrument quality and price: student models, step-up models, and professional models. These stores also service their local schools with road reps who visit them regularly to take and deliver orders. Specialty Shops, such as a professional quality guitar shop, carry high-end professional instruments. They are most often run by a single entrepreneur-musician, who is a performer on the particular instrument sold. For professional musicians, these stores with their elite product lines are like mini “meccas” where they can visit the store and try out the instrument. Consumer Audio Equipment retailers offer three levels of audio equipment: professional, semi-professional, and equipment for home use. Electronic retail stores compete with the specialists in this area, and at the high end, there are specialized sound companies that offer “industrial strength” gear that for use in a professional setting. Keyboard retailers offer a full line of vertical and grand acoustic pianos, as well as electronic keyboards. Acoustic instruments can also include electronic interfaces, such as the Yamaha Disklavier. The industry standardization of MIDI (Musical Instrument Digital Interface) makes it easier to compare various options. Buyers will typically look at both the interface ease and price.28Baskerville, David. Music Business Handbook & Career Guide. Los Angeles: Sherwood Publishing Partners. 2017. There are only a few full line print music retail stores left on the market. The major institutional print dealers are J.W. Pepper, Stanton’s Sheet Music, and Sheet Music Plus. While potential profit margins are in this category are high, there are challenges facing printed music related to innovations in the move toward digital print music. However, most retailers offering print music are also becoming involved with the digital print options offered by many publishers. To assess the needs of the music products industry and the curriculum offered by most music industry programs, two surveys were created and circulated during the spring of 2017. The first survey was sent to MEIEA (Music and Entertainment Industry Educators Association) members and queried current coursework offered by their schools. The second survey was distributed to music products retailers and manufacturers through the assistance of Music Inc. magazine, a popular trade magazine in the music products industry with a circulation of 6,500 and a 3:1 breakdown of retailers to manufacturers. 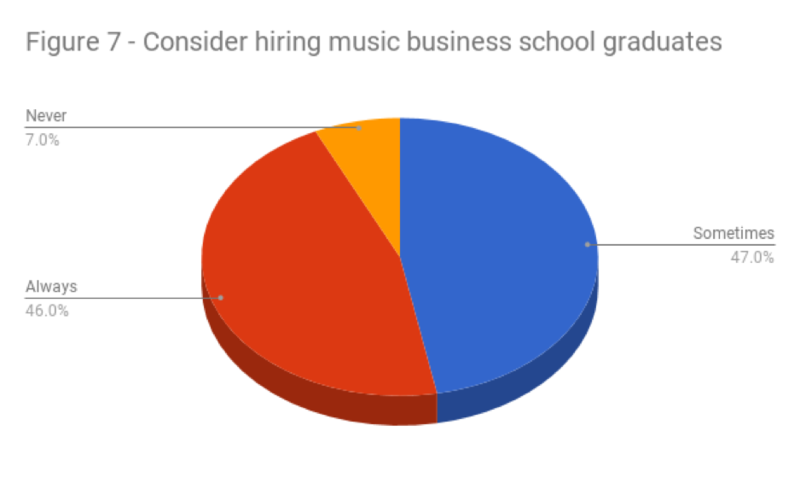 This second survey asked the music products industry employers to identify the needs of their businesses when hiring young professionals into their companies. Below is a summary of the two surveys conducted with music industry educators and music products industry companies. It gives insight into how this topic is being incorporated at the collegiate level and what music products companies are looking for in music industry graduate hires. Do you cover the music products sector in your teaching? 59% of the responding schools did not cover any portion of this in their teaching. Do you have a course dedicated specifically to this topic? Only 13% responded affirmatively that they had a dedicated course. Any teaching that was done for the remaining schools was incorporated into more general coursework. How many classes cover topics about this sector? Only 24% of the responding schools had any classes at all covering these topics. What subjects do you cover in the music products industry? 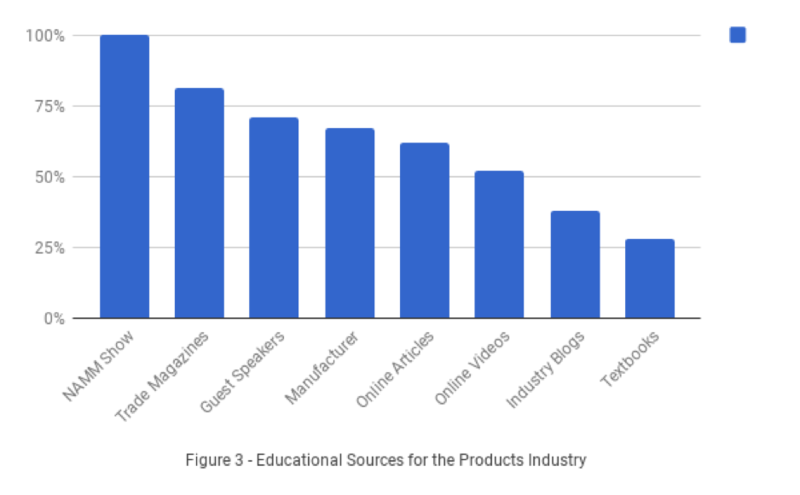 Most schools responded that they covered information about the various trade organizations such as NAMM and that they outlined the various market segments within the products industry. 75% covered some topics regarding sales and the manufacturer/retailer relationships. Less than half had any coverage of general retailing or a breakdown of customer profiles. Most strikingly absent was any discussion on the complex consumer and dealer financing relationships that define the various industry segments so dramatically. Only 16% had any discussion on consumer financing, for example and only 25% covered dealer financing relationships. Over half, however, had some insight into the future trends of the industry. What are the reasons the music products segment is not covered in your school? This question was open-ended, enlisting editorial comments rather than objective statistics. In general, the two overarching concerns stated were “lack of time” and “lack of student interest.” Many had existing curriculum in place and did not have room to add additional subjects, or was simply not the focus of the initial curriculum when it was developed. A more profound statement, however, was the dependence on student interest as a guide for subject material. It was even described as “ancillary” material by one respondent. How would you rate the interest level in this sector by your students? 56% of responding schools ranked student interest in this segment as low and only another 20% ranked it as having medium interest. Are your students aware of the job opportunities in this sector? 59% indicated their students were aware or very aware of job opportunities in the music products industry. The majority of the remaining respondents said that the students were at least somewhat aware of the jobs. How knowledgeable are you in teaching this sector of the music industry? 22% of music industry faculty indicated they were very knowledgeable and another 61% felt they were at least somewhat knowledgeable of the subject. Do you take students to the NAMM Show? 81% of the respondents do not take students to the NAMM Show even though they would all be eligible given NAMM’s current policy. Do you have an internship program at your school? How long is it? 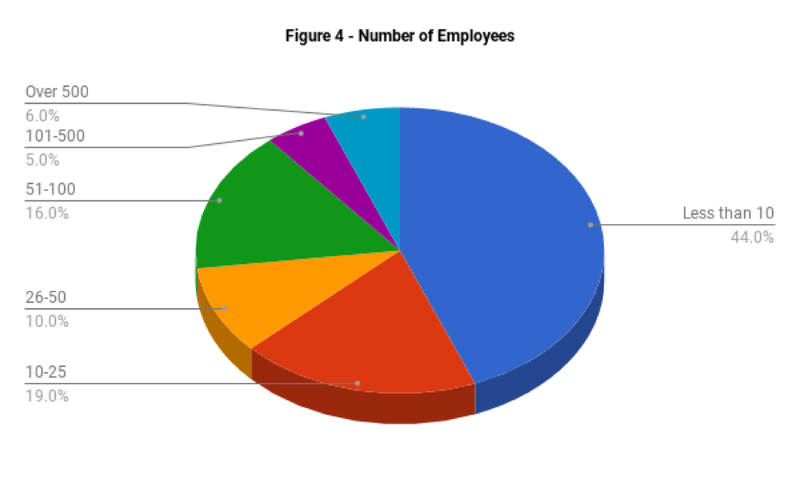 100% of the surveyed respondents have an internship program and of these 70% were focused around a semester schedule. With the assistance of Music Inc. magazine, an email was sent to music retailers and manufacturers. 119 businesses completed the survey. The following results were compiled from the information from the twelve basic questions asked. 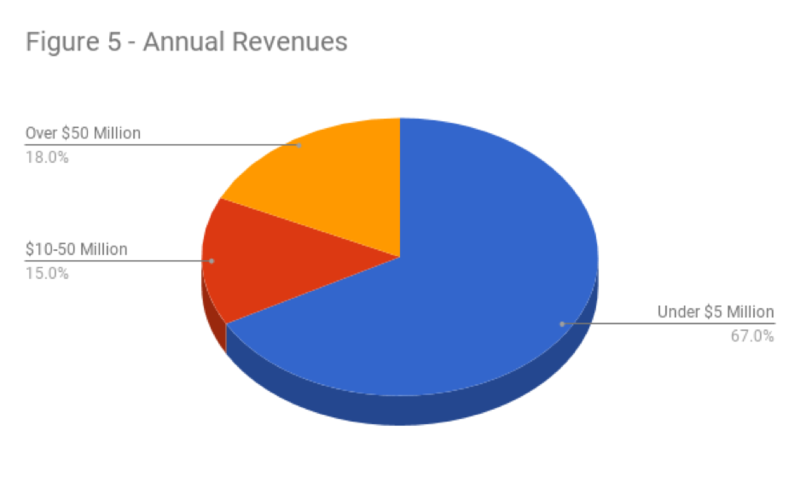 What is the overall revenue range for your company? Are you a manufacturer or retailer? 70% of responding companies were in the retail sector. 30% were manufacturers. This is statistically close to the overall profile of the survey pool. If you are a manufacturer, what product market segments do you represent? Most of the responding manufacturers represented percussion, fretted instruments, pro audio equipment, school instruments, and accessories. This is consistent with the largest industry sales segments as last reported in Music Trades industry reports. If you are a retailer, what product market segments do you sell in your stores? 50% of the responding retailers carried all the lines mentioned in the survey except software and pianos. 80% included repair services and 75% provided instructional lessons as part of their product mix. Rank different academic subjects in importance for your employees. Would you consider newly graduated students from a music business school for positions within your company? How many positions become available on average at your business each year that a person with a music industry education would qualify for? How long is your internship program? What skills do you look for in an intern? In which departments could an intern work? Name any that might apply. How can universities and colleges better prepare students for jobs in the music industry? The focus of the overwhelming majority of the responding schools reflects the fact that the music products industry is generally not a prime focus of their curricula. While some schools incorporated a few basics on the industry, especially the work of NAMM into their coursework, most did not have any specific classes that address this part of the industry. Most responding schools felt that the student interest in this area was low and modeled much of their curriculum, in part, to reflect areas of greater student interest. While many of the instructors indicated some knowledge of the industry and their students were somewhat aware of job opportunities, the curriculum continued to reflect areas more traditional to the music business programs such as recording, publishing, or live performance. There seems to be a general lack of traditional resources covering the music products sector, such as textbooks and peer-reviewed published articles. While many of the instructors indicated that NAMM would be a great resource for this information, most do not take students to this event. However, under the umbrella of the NAMM Foundation, in collaboration with the College Music Society, NAMM’s GenNext is a program which brings together students studying in music industry programs and their faculty from across the country to the NAMM Show to participate in various educational events to teach the students more about opportunities in the industry. Registration allows all-access to all four days of The NAMM Show, extensive professional development sessions presented by experts that are designed to jump-start your career in music or the music products industry, and exclusive networking events with like-minded peers. "29The 2017 NAMM Global Report. In contrast, the music businesses surveyed had very strong opinions about the quality and content of what they believe is being taught at music business schools. Most indicated in written comments a desire for more emphasis on traditional business courses including accounting, finance, marketing, retailing, and sales. More specifically, they indicated much less interest in a knowledge of recording, licensing, or contract law. In addition, they indicated a strong desire for students coming from a music industry degree background to also be taught the “soft skills” of communication: listening, continuous learning, and overall people skills. They also indicated frustrations with entitlement issues or work-ethic problems sometimes associated with the millennial generation. Most critically, they indicated a need to have hands-on projects and information specific to the products industry taught before students get to the workforce. They believe that a realistic explanation of career paths should include the products industry, often with a background in retail experience. A general misunderstanding as to whether the music products industry should be considered a viable part of the music industry was conveyed by many of the educators surveyed. With a $16.3 billion global valuation, it is hard to ignore such a large employment opportunity for students. 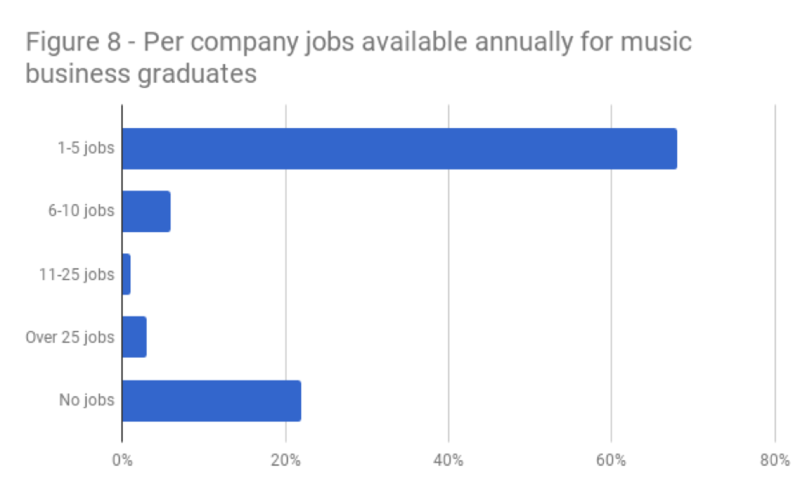 Music businesses in the music products area indicate a broad interest in students with a music industry studies background and have a significantly aggressive hiring rate, especially for relatively inexperienced workers such as new graduates. The frequently overlooked music products area should be incorporated where possible in a music business curriculum. Continued focus on traditional business skills as well, would give a stronger base of knowledge for music industry students. The co-authors of this article wish to acknowledge Frank Alkyer, the publisher of Music Inc., a division of Maher Publications Inc. for his assistance in helping us deploy the survey to music products companies. Maher Publications also includes DownBeat and Upbeat Daily. The music products industry is a relationship-based business, and it is heart-warming to know that our colleagues in this industry will go out of their way to help us conduct research and gather information that we hope will improve the overall health of the industry. 5 “The 2017 NAMM Show Delivers" Music Inc. March/April 2017: 46-49. 6 “Musikmesse 2017 Numbers Down Slightly from Last Year, but Positive Reaction to Ongoing Restructuring, MMR, May 2017, p. 30. 7 “Welcome to Music China.” http://music-china.hk.messefrankfurt.com/shanghai/en/visitors/welcome.html. 8 "A year of the status quo." Music Trades, April 2017, p. 104+. 9 "Music Retail Around the Globe." Music Trades, May 2017, p. 68. 11 Edgers, Geoff. “Why My Guitar Gently Weeps.” Washington Post, June 22, 2017. 13 "The music industry report card for 2016: which categories are up, which are down, and why, along with analysis of the trends driving industry revenues." Music Trades, Apr. 2017, p. 58+. 16 Petersen, G. (2016, 10). 100 years of the condenser microphone. Front of House, 15, 53. 25 "Guitar Center Acquires Musician’s Friend for $50 million." Music Trades, June 1999, p. 153. 26 "Guitar Center Inc.: Music & Arts Acquisition Will Expand Beginner Segment." Wall Street Journal (New York, N.Y.), February 10, 2005. 27 "Guitar Center Agrees to Buy The Woodwind & The Brasswind Assets." FinancialWire, 2006, 1. 28 Baskerville, David. Music Business Handbook & Career Guide. Los Angeles: Sherwood Publishing Partners. 2017. 29 The 2017 NAMM Global Report.